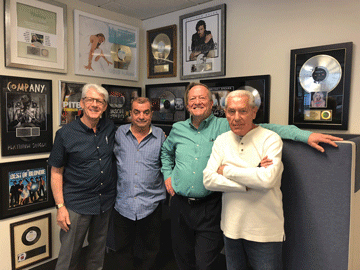 LOMM Publisher Wayne Bell and associates had the opportunity to visit the offices of Universal Music Group, Warner Music Group, US Meda Rights and others in Los Angeles, CA. Globally renowned Master Producer Tony Bongiovi lead the group in meetings at the various music groups on discussions of new ideas, distribution and other offerings. Bongiovi has recorded, produced and sold over 1.5 billion songs globally making him one of the most successful producers in music history. He is also the founder of Power Station Studios – NYC and Florida – and has recorded the most successful acts in music history from the RAMONES to AEROSMITH to OSBOURNE. Bongioivi has current patented technologies that span the globe through numerous multi-national corporations including airline, motor vehicles and musical instruments. Known as an influencer in the digital technology sector, Tony has kept up with the times and surrounds himself with new talent, entrepreneurs and modern day dreamers. The four man team met with numerous heads of the music industry discussing new ideas, technologies and moving forward in the high tech digital age. Said team member Mr. Jordan, “You can’t get much higher in the industry; the industry leaders we are meeting with either run 85% of global music or they made music what is it today.” Jordan has made numerous hit records in his career, including the 1972 global hit “Popcorn” and has made many millions from merchandising in the entertainment industry. 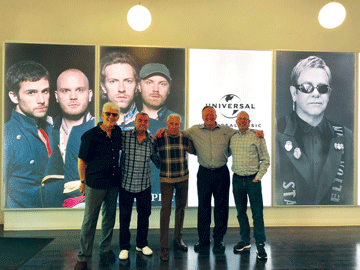 Universal Music - Universal Music was once the record company attached to film studio Universal Pictures. The company’s origins go back to the formation of the American branch of Decca Records in September 1934. Artists signed to American Decca in the 1930s and 1940s included Louis Armstrong, Count Basie, Billie Holiday, the Andrews Sisters, Judy Garland, Louis Jordan, and Sister Rosetta Tharpe. Santa Monica, CA is home to Universal Music Group’s global headquarters which leads the industry with almost 7,000 employees and $6.8 billion in revenue (2017). Warner Music Group - The film company Warner Bros. had no record label division at the time one of its contracted actors, Tab Hunter, scored a hit song for Dot Records, a division of fellow Paramount Pictures. In order to prevent any repetition of its actors recording for rival companies, and to also capitalize on the music business, Warner Bros. Records was created in 1958. Warner Music Group now has over 4,500 employees, revenue of $4 billion (2018) and is headquartered in New York City, NY.